CALL US NOW AT (508) 283-3008 SO WE CAN SAVE YOU TIME AND MONEY! This is the major advantage Auto Advisors offer over all those Internet and shopping club programs. We consult with you personally and work to get you the best overall transaction. We improve buyer knowledge by explaining all the ins and outs. We can do the shopping, advise on warranty and after-market items, and oversee the financial paperwork. While many consumers relax after the price is set, the selling process is not actually over! In most cases, this is when most of the profit on a car purchase is made. This is where our experts help save you additional time and money. We understand using an “advisor” to shop for a car is a new idea. But there are plenty of people that can share with you how happy they are that they were referred and made the decision to work with an Auto Advisor. In fact; Auto Advisors have assisted credit union members and their friends, family members and co-workers purchase over 30,000 new and used cars – many of these people 4, 5, 6 or more times in their families! 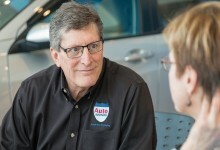 Currently serving over 180,000 credit union members across New England, Auto Advisors has been successfully serving credit union members since 1990. Today, the Auto Advisor Program remains committed to generating direct loans for its credit union partners. Our mission is to provide a haggle and hassle-free car buying experience for credit union members at a low, competitive price, while insuring that each and every automobile loan remains with the credit union. Not a member of a credit union? No problem! Call us now at (508) 283-3008 so we can get you set up... for FREE.